The Hush Sound not only blends a wide variety of sounds, but it actually has a male and a female vocalist that are both very talented. The album Like Vines seems to be an auditory canvas with each song illustrating a different atmosphere. From the song “A Dark Congregation,” a more emotional melody, to “We Intertwined,” a quick paced song with a very positive mood. This album is very relaxing tome and puts me in a relaxed state. I had fun kicking back and feeling the tunes while knocking out some homework. Devin’s Hell or Heaven rating is 1-5 stars, 1 being absolute hell, or worse if you can believe it and 5 being more awesome than a full semester of easy A classes. 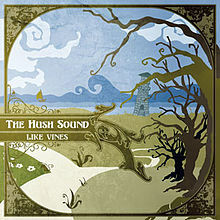 The Hush Sound’s “Like Vines” gets 4 stars, which is the equivalent to your favorite food item also being wrapped in bacon.